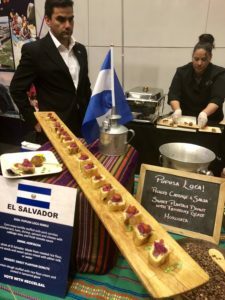 The Tenth Anniversary Events DC Embassy Chef Challenge was held at the Ronald Reagan Building and International Trade Center on Thursday night, with chefs from 28 participating nations showcasing their cuisine. 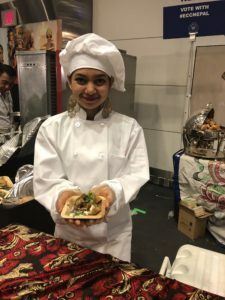 Embassy chefs exhibit their talents, ultimately competing for the honor of being named a People’s Choice or Judge’s Choice Champion. Colorful displays from the participating countries serve as beautiful complements to the food. 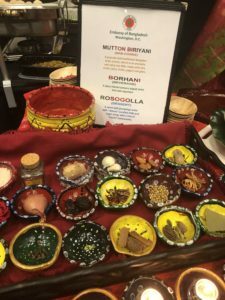 It’s a night of delicious dishes, delightful cultural displays and entertainment, and international camaraderie, making this one of my favorite events of the year. 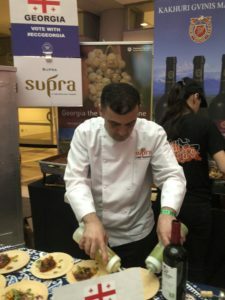 One of the highlights is queuing up with attendees at the various stations, excitedly sharing sentiments about the not-to-be-missed dishes and drinks. 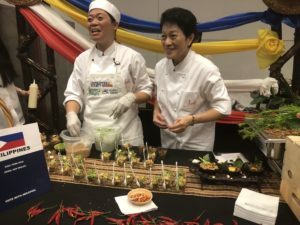 Chef Abigail “Abie” Sincioco-Mateo representing the Embassy of the Philippines was selected as the People’s Choice Champion, as well as the Judges’ Choice Champion for her plate of Pork Sisig. 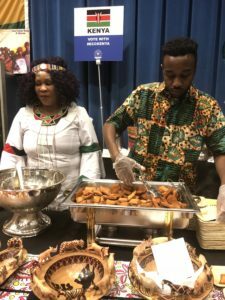 Both second-place prizes were given to the Embassy of Ghana Chef, Francis Otoo, for his Lamb Jollof Rice. 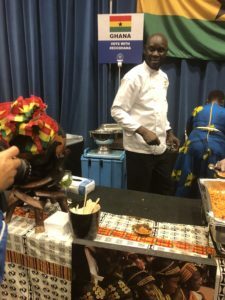 Chef Jouvens Jean from the Embassy of the Republic of Haiti took home the third-place prize in the Judges’ Choice category for his Kabrit Kreyol served with Haitian Cinnamon Water. 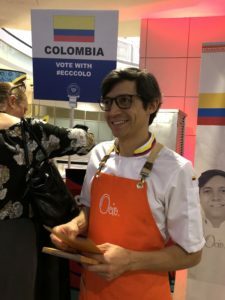 In the People’s Choice category, third-place was awarded to the Embassy of Colombia Chef, Alex Salgado, for his Coconut Shrimp with Pancetta and Heart of Palm Ceviche. Two new awards were handed out this year as well. 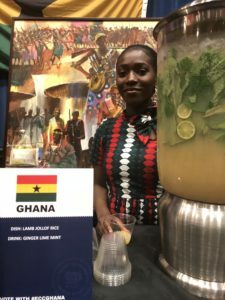 The Best Beverage presented by Pepsi was awarded to the Embassy of Barbados for their Drunken Bajan Lemonade developed by mixologist Philip Antoine and Chef Creig Greenidge. 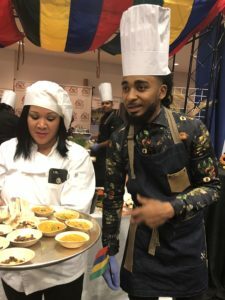 The 2018 Event DC Embassy Chef Challenge presented by TCMA sponsors include Astral Tequila, Bundaberg, Cultural Tourism DC, Cutco, Legacy Partners Distribution, Macy’s, RCN Business, Social Driver, Sombra Mezcal tequila, Teahouse/Pureleaf, TYKU Sake and Voss artesian water.